The euro area trade surplus expanded to 21.24 billion euros in March from 20.93 billion euros in February. Exports rose by 0.8% in the month while imports rose by 0.7%. However, over three months, both exports and imports are falling. Manufacturing flows show both exports and imports are locked in a progressive slowdown phase with double-digit growth rate declines over three months for both exports and for imports of manufactured goods. This trend is not good news for growth. 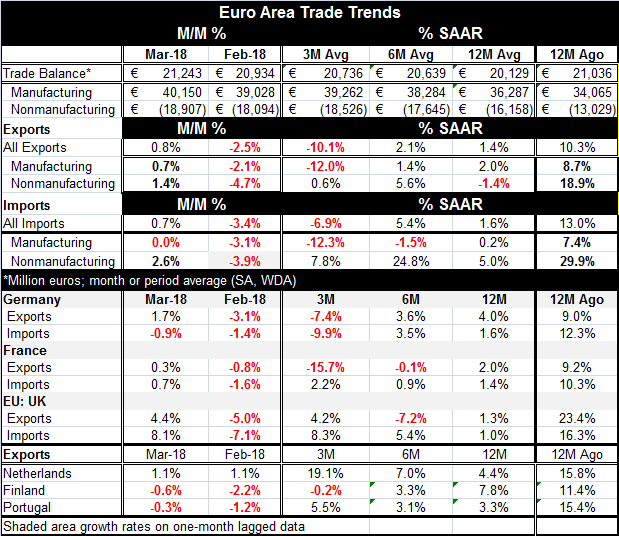 The EMU manufacturing trade balance rose to 40.15 billion euros in March from 39.03 billion euros in February; it represents the third largest surplus on record for that account. Both manufactured exports and imports are slowing fast; these topical flows are a better diagnostic for underlying activity than total nominal flows because they are largely unaffected by the turbulence that has buffeted commodity prices. Commodity price instability causes total nominal trade flows to become a poor reference for underlying growth. Manufacturing export and import trends both have dropped their year-on-year growth rates from double digits in 2017 to under 2% currently. Weakness, especially the sharp onset of such weakness, suggests that both the EMU domestic economy and EMU export markets are slowing. This is the weakest manufacturing growth we have seen in both flows since both showed year-on-year declines in late 2016 and in 2013 before that. However, there also was a sharp slowing of export and import flows in 2017 but most of the weakness was in exports. And while it was sudden, it was also brief and not as severe as it is now. Real export flows across an array of countries are available for data through February. Inflation adjustment allows total flows to serve as a reasonable activity indicator. They show that total export volumes are falling or decelerating on a broad front. Over three months, five of eight countries show export volume declines. Three of eight also show declines over six months. Flow deceleration, however, is also widespread. Over three months, export volumes decelerate in six of eight countries. The result is the same for six-month growth rates compared to 12-month growth rates. Over 12 months, flows still decelerate on a broad front in five of eight countries with the U.S., France and Finland as exceptions showing accelerating flows. The U.S. is a minor exception with real export acceleration over 12 months of less than one percentage point. Trade data trends are very discomforting. The Baltic dry goods index, however, that had been weakening, has caught on and rebounded after a period of decline. Still, there is a lot of weakness in trade volumes and in up-to-date data an EMU manufacturing trends. EMU activity reports also have been showing weakness. U.S. data have been spotty with a good deal of consumer spending weakness in the face of what have been resilient manufacturing data. Most observers are looking for the U.S. economy to maintain speed or to accelerate, propelled by fiscal stimulus. The Fed is hiking rates and has plans for normalcy or more than that; that would bring the Fed funds rate up to 3% or more. This plan is playing some role in the disruption of capital flows in developing nations and it has been moving the dollar higher. It is too soon to tell of foreign exchange movements will be broad enough, large enough and sustained enough to impact the economic conditions that are in train and to unseat U.S. growth or to provide new stimulus to Europe.